The notorious poisoning of the former KGB agent Alexander Litvinenko with a radioactive agent left a radiation trail across London. Police and health officials bill currently makes up three million pounds ($6 million). Radiation was found at sites ranging from a taxi cab to a lap-dancing club after the death of Alexander Litvinenko, according to a report released by Westminster City Council. Litvinenko, a harsh Kremlin critic who had received asylum in Britain, died Nov. 23, three weeks after he was poisoned with the radioactive isotope polonium-210. The council, whose authority covers much of central London, was responsible for dealing with the public health consequences of the killing. 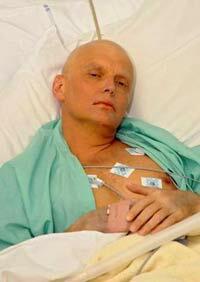 Officials checked more than 1,000 people and 47 sites for contamination after Litvinenko's death. Traces of radiation were found at 27 sites, including a taxi, a Moroccan restaurant and eight airplanes, Westminster council said. The council said it spent 250,000 pounds (US$500,000; EUR 370,000) cleaning up contaminated sites, while the Health Protection Agency spent 2 million pounds (US$4 million; EUR 2.9 million) checking people and places for radiation. The police investigation cost another 1 million pounds (US$2 million; EUR 1.45 million). In a deathbed statement, Litvinenko accused Russian President Vladimir Putin of being behind his poisoning - a claim the Kremlin strongly denies. His death sparked a crisis in Anglo-Russian relations, with Britain naming Andrei Lugovoi, a Russian businessman and former KGB agent, as a suspect in the murder and demanding his extradition. Russia refused, saying it is constitutionally barred from extraditing a Russian citizen. Lugovoi is one of three Russians who met with Litvinenko in a London hotel on the day he fell ill, but has denied any involvement in his death. Investigators made Lugovoi their prime suspect after tracing a trail of polonium at sites including Litvinenko's home, car, three hotels, Arsenal's soccer stadium, planes and a business block used by self-exiled Russian tycoon Boris Berezovsky, a Litvinenko ally. The council's report identifies four previously unreported sites of contamination, including seats and cushions at Hey Jo, a central London "gentleman's nightclub" popular with Russian businessmen. Traces also were discovered on the handle of a shisha pipe at the Dar Marrakesh restaurant in the Soho entertainment district, in a Mercedes taxi and in Litvinenko's own Mercedes car. Westminster Council said its report, which looks at how public health officials should handle any future cases of radioactive contamination, will be sent to the police and government departments.